6.19 RESCUE IN YULIN, CHINA NEEDS HELP! A group of activists frantically called our foundation director, Dr. John Sessa, about a rescue called 6.19 that was reported on June 19, 2018. They informed us that 142 dogs were on the verge of death. Thankfully, these activists rescued the dogs out of the meat traders' trucks after surrounding the truck with demands of surrender using the penal code protecting humans against rabies. They found the animals with as many as six shoved into a small crate. They immediately placed the animals into individual cages and transported them a to a temporary shelter near the rescue site. This is where the hard work began. Now, these activists had 142 dogs in critical conditions that all needed to be diagnosed and cared for immediately. They were able to place 100 dogs with local rescue groups and hospitals around China. However, rescue 6.19 had 42 dogs that still required help and placement due to lack of financial commitment. Their only options for the dogs are to turn them over to the government, who will likely return them to the meat traders or to the monks, who will most likely kill them. 42 dogs in China are in near-fatal condition, need extremely costly and 24/7 emergency care to survive. What is The Vanderpump Dog Foundation doing? Without hesitation, we agreed to help. As a foundation, we leveraged our resources in China to organize the dogs’ transport from the temporary rescue site to local hospitals that could accommodate the dogs. All 42 of the dogs have varying degrees of distemper and are in hospitals under the care of Chinese veterinarians. However, 42 dogs all carrying this disease, and other various injuries from the meat traders, is overwhelming. To ensure the best care and equal attention for the dogs, we transported them to eight different hospitals around the area. Each dog has received a diagnosis of their condition and estimated cost for survival. The Vanderpump Dog Foundation's Executive Director, Dr. John Sessa, is there now on the ground in China checking the hospitals most nights and mornings, organizing all of the medicine and treatments with the doctors in China. We are sure that you are all wondering how you can help make a difference in this situation. You are what makes a difference in this community. We love our passionate followers and contributors to our cause. As a foundation, Vanderpump Dogs promotes a self-sustaining module at our rescue center in Los Angeles. By giving back 100% of the proceeds from grooming, retail, and adoptions to our Foundation, we are often able to apply your donations to other rescue missions like this one. Right now, we are estimating that our rescues in China will need $30,000 per month to survive this trauma. This will pay for; $1,750 for transportation, $5,000 co-pay for the hospitals, $3,500 to receive blood testing with diagnostics, all associated medicine including spay, neutering; $1500 per day for 24-hour veterinarian care, and hospital staff. Please click the button below if you would like to give to our Yulin Rescues. Help us give them a better chance at life and survival. We appreciate all of your help and support! Together we can make a difference. If you haven’t already, we’d like you to meet Boska! Check out this video to see Boska's full story! Meet our rockstar, Sir Franklin! Sir Franklin is a 10-year-old Pomeranian who came to The Vanderpump Dogs Rescue Center with a horrible yeast infection that infected his skin after years of neglect. Our team rescued him from a high kill shelter in Los Angeles. We shaved him, treated his skin, and he finally found his forever home here at The Vanderpump Dogs Rescue Center. CHECK OUT THIS VIDEO TO SEE SIR FRANKLIN'S FULL STORY! OUR THIRD ANNUAL WORLD DOG DAY! On Saturday, May 19, 2018, we hosted the third annual ‘World Dog Day’ in West Hollywood, California. The event, presented by NexGard (www.nexgardfordogs.com) and SUR Restaurant & Lounge (www.surrestaurant.com) focused on the celebration of dogs as well as raising awareness about global dog abuse and ending the Yulin Dog Meat Festival in China that begins later next month. Nearly 4000 people and their dogs were in attendance to join in on the festivities. This included, over 35 pet-centered vendors, dog agility park, a morning “Doga” class and the Lucy Pet K-9 Wave Machine truck that enabled over 100 dogs to surf on San Vicente BLVD. Singer, songwriter and animal welfare campaigner, Leona Lewis welcomed the thousands of guests to the event and presented the “Vanderpump Dog Foundation Awareness Ambassador” to ‘Bo,’ who was rescued by Executive Director of the Foundation, Dr. John Sessa last year while aiding survivors of the Yulin Dog Meat Festival. Additionally, singer Lance Bass and his husband, Michael Turchin, served as hosts of the 2nd Annual “VP Posh Puppy Pageant” sponsored by Posh Puppy Boutique (www.poshpuppyboutique.com) and 1st Annual “Doggy Look a Like Contest” sponsored by Kickee Pets (www.kickeepants.com) that crowned, Vanderpump Rules’ Brittany Cartwright and her dog, Monroe, for the second year in a row. Since opening the doors of our Rescue Center on W. 3rd Street in Los Angeles in March of 2017, the Vanderpump Dog Foundation has adopted out over 550 dogs. Events like ‘World Dog Day’ help with accomplishments like this. We cannot wait to see you all next year! Pictures from our fashion show! Pictures from our red carpet! OUR SECOND ANNUAL WORLD DOG DAY! On Sunday, June 25, 2017, we hosted our second annual World Dog Day in Los Angeles, presented by Zappos for Good (www.zappos.com) and SynLawn (www.synlawn.com). The day focused on the celebration of dogs as well as raising awareness about global dog abuse and ending the Yulin Dog Meat Festival in China, which started on June 21st. The event stood out in stark comparison against the atrocities occurring annually in Yulin. The Vanderpump Dog Foundation completed the paperwork for our 100th adoption on World Dog Day, a great accomplishment after only being open since March 2, 2017. St. Martin’s Animal Foundation (www.stmartinsrescue.org), who was also in attendance, had many successful adoptions, as well. Other sponsors of the event included SUR Restaurant and Lounge (www.surrestaurant.com), Posh Puppy Boutique (www.poshpuppyboutique.com), PRAI Beauty (www.praibeauty.com) and BLK Water (www.getblk.com). Many celebrities also attended the event, including Christy Gibel, Nicky Whelan, Kerry Rhodes, Emma Perry, Asia Monet Ray, and Vanderpump Rules’ Scheana Marie, Katie Maloney Schwartz, Tom Schwartz, Ariana Madix, Tom Sandoval, Lala Kent, James Kennedy, Kristen Doute and Brittany Cartwright. All of our rescues loved learning their new tricks - everyone loved Kyle! To learn more about Kyle and his techniques visit Vanderpump Dogs every Friday at 10AM or find him on social media @KyleKittleson! Vanderpump Dogs had the pleasure of hosting the amazing Jeff Minich, author of the “Nuggies” children’s book series, for a reading and signing of his latest book, “If I Could Climb Trees.” All proceeds from book sales went directly to The Vanderpump Dog Foundation and we can't thank Jeff enough! Fans of Jeff, dog lovers, and children all showed up for a wonderful time - each leaving with a signed copy of this fantastic book... plus, they were able to play with our rescues! We have a few signed copies still available in store for purchase, so come on by and pick up a copy! THE OPENING OF THE VANDERPUMP DOG CENTER! We are thrilled to announce that our Vanderpump Dog Center is now open! We are so thrilled to finally be opening our Vanderpump Dog Rescue Center! On March 1st we opened the doors to our gorgeous 6,000 square foot location at 8134 West 3rd St, West Hollywood. At our flagship location we will focus on the rescue, rehabilitation and re-homing of dogs to loving homes. Here's a sneak peek of our Press Preview Party! Press, celebrities, donors and supporters came out to tour the new center! On November 3rd, 2016, The Vanderpump Dog Foundation hosted our first annual Gala at the Taglyan Cultural Complex in Los Angeles. The purpose of our Gala was to raise awareness about our efforts to end the dog meat trade, draw attention to our current and future campaigns within the US and raise money to continue our Foundation’s work. The Gala was a complete success – hundreds of people gathered together to celebrate dogs, and help us improve the lives of abused and mistreated dogs both domestically and internationally. The Gala’s red carpet opened at 6pm, with a beautiful candlelit cocktail hour and a silent auction. Celebrities and attendees bid on a variety of donated luxury items; from hotel stays to dog beds and diamond earrings. 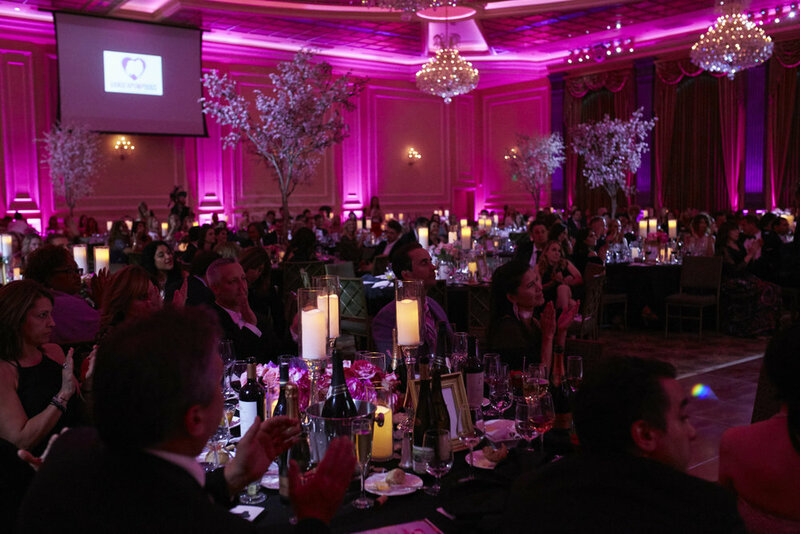 At 7:30pm the doors opened to a stunning ballroom complete with pink roses and cherry blossom trees, for a dinner that included music, dancing, celebrity performances, celebrity speakers and a live auction. The night kicked off with an amazing performance by Leona Lewis singing our Stop Yulin Forever campaign song “(We Are All) Looking For Home,” that was generously donated to the Vanderpump Dog Foundation by award-winning songwriter Diane Warren. Eric Benét also gave a fabulous performance to the attendees, which was followed up by a lighthearted performance (complete with dancing dog costumes!) by some of the troupe and pros from Dancing with the Stars. Many of Lisa’s close friends showed up to support the cause, including a wonderful amount of celebrities who helped raise awareness on the red carpet and through social media. Real Housewives cast members Gretchen Rossi & Slade Smiley, Taylor Armstrong, Stephanie Hollman, Eden Sassoon, Joyce Giraud, Dorit & Paul Kingsley and Kyle Richards & Mauricio Umansky were in attendance. Vanderpump Rules cast members Jax Taylor, Kristen Doute, Brian Carter, Brittany Cartwright, Scheana Shay, Stassi Schroeder, Peter Madrigal, Katie Maloney-Schwartz, Tom Schwartz, LaLa Kent, Ariana Madix, Tom Sandoval and James Kennedy came out to support. Other celebrities including Extra’s Mario and Courtney Lopez, Dance Moms’ Nia Sioux, Million Dollar Listing Los Angeles’s David Parnes and James Harris, Terri Seymour, Christy Gibel, Bruce Vilanch, Mohamed Hadid, Julz Tocker, Fortune Feimster, and Rochelle Aytes were also in attendance.